One cheque for TT$5 million to Patrick Manning's PNM (Trinidad). Keltruth Blog questions how many Barbados dollars ended up covering CL Financial Group's political donations instead of paying CLICO Barbados policy holders. It’s always interesting to go back a year or so and see what people were saying and thinking as the whole CL Financial / CLICO mess was oozing its way through the sewer of lies and corruption engineered by the company leadership and their political lapdogs. Here’s an article we first published in July of 2009. How Many Millions Did CLICO & CL Financial Spend On “Political Donations” ? The central theme of the article is: CL Financial, CLICO and the associated companies gave millions to Caribbean political parties and politicians – and that money should now be returned by the politicians. In consideration of the fraud and nonsense that went on at CL Financial & CLICO, we believe that the political parties and politicians should return this money to the little people who have been hurt most by the corruption and the failure of the politicians to properly regulate Parris, Duprey and the rest of the so-called “leadership” that caused this mess. How Can Prime Minister David Thompson Justify This Abuse By Leroy Parris & CLICO Barbados? In the corrupt convoluted mess that is the story of CL Financial and CLICO Barbados, there is one fact that stands clear: CLICO Barbados would have done just fine weathering the financial storms if only CEO Leroy Parris and the other CLICO management hadn’t allowed their company to be raped to prop up CL Financial’s fraudulent schemes and payoffs. … Leroy Parris and his fellow conspirators traded CLICO Barbados financial health and assets for worthless paper secured by Florida swampland in a deal arranged by other CL Financial companies. And that is just one example of the “management” provided by Leroy Parris. Now your tax dollars are cleaning up the mess and Leroy Parris continues with his fat government position at the CBC as given to him by his old friend Prime Minister David Thompson. And at CBC, Parris still can’t seem to obey the rules – even the ones he insists upon for other lower human beings. Keltruth Blog has the story that CL Financial and associated companies paid millions of dollars to Caribbean politicians – writing cheques like the one featured at the top of our story. Without integrity legislation and the transparency of campaign financing rules and disclosure, Barbados citizens will just have to guess as to the amount that was given to David Thompson’s DLP campaign. But no matter how many tens of millions of dollars that CL Financial and CLICO gave to politicians, YOU, the Barbados taxpayer, are on the hook. Prime Minister David Thompson is bailing out CLICO and your tax dollars are going to cover the sins of Leroy Parris and company. Read Keltruth Blog’s CLICO: Trinidad Politicians Before Policy Holders? When are you going to stop telling untruths, BFP? Is all of this over the Graeme Hall swamp? I know this IP address will now get blacklisted as others did. Produce one shred of evidence that Clico Barbados did any of the above or that Clico Trinidad received a cent in dividends from Clico Barbados. BFP, you are a bunch of dangerous liars!! Kitty, I have some observations and questions for you. First of all I went to the KEltruth website and from there followed the links to the Trinidad and Tobago Express story that shows CL Financial gave $20 million to the People’s National Movement party. Quote from that story that had the cheque shown above too. “Sources say CL was the single largest financier to the PNM’s 2007 re-election campaign”. That proves that CL Group was spending millions on political donations. That is step one in verifying the BFP and Keltruth stories. Then I went to the two BFP stories linked above and followed their links about CL Financial and CLICO and read the original court papers filed in the Florida land fraud case that show that CL Financial subsidiaries purchased Florida land for much more than its true value and that “incentives” were paid to CL insiders to have the company accept the overprice of the land. I also read in the T&T Newsday article linked from BFP about “criminal” activities associated with high ranking CLICO people going back several years. That is step two which is showing that CL group is weak because of over-valued real estate holdings and fraud amongst other things. That is step three that shows our Barbados tax dollars are going to bailout “the region”. Fourth, Prime Minister Thompson says Clico Barbados is in bad shape and it would take a “significant sum” to bail out CLICO Barbados. “”What we have been giving undertakings on is that the Barbados operations will meet all of its legitimate obligations in Barbados and the Eastern Caribbean,” Thompson said. The Prime Minister added that if Government had to look for a sum of money to bail out CLICO Barbados, it would be a significant sum. And he assured that the injunction registered in Trinidad would not be registered in Barbados. “Our first commitment is not to any individual in CLICO. It is to the 1 500 jobs and the 1 500 people who are still working and the people who have pension funds,” he said. In addition, he said, the only correspondence he had received in respect of CLICO was from “people living in the islands” asking Barbados to intervene and assist them in getting their money from the Trinidad operation. He said Government had realised how severe the situation was and that was why it had placed $10 million into the regional fund. Summary: CLICO Barbados was weakened by the fraudulent activities of CL Group. CL Group gave TENS OF MILLIONS to Trini political parties and NOW YOUR BARBADOS TAX DOLLARS ARE GOING TO BAIL THEM OUT. How about this? How about Barbados Political Parties return any money they took from CL Group and associated companies? !!! Could as well watch for hell to freeze over too. The chances for either one happening are probably about the same. I still waiting for the proof BFP! 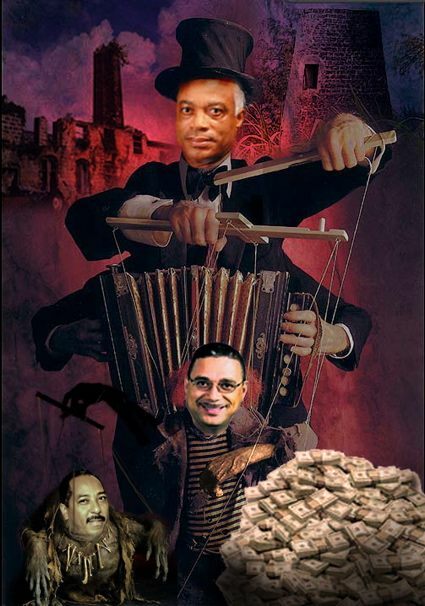 Another feeble try on your part…..the David Thompson Administration is the most prudent and accountable administration in the Caribbean over the past 15 years. BARBADOS NATIONAL BANK (BNB) has submitted a formal bid to take over CLICO Mortgage and Finance, a subsidiary of CLICO Holdings (Barbados) Limited. I went through the process that clicker did. I have my proof that my tax dollars from Barbados are paying for CL’s debt: part of which came from giving millions to political parties. Therefore, my tax dollars are supporting the political debts (and other debts) of CL Group. That is proof enough for me. By what process? By what law? To whom? No FOI. No way for me to examine government documents. No way for the press to examine government documents. No detail accounts released. By what magic do you say the Thompson government is “accountable”? Because they say so? Because you say so? Tell them to list their campaign donations in detail and that will be a start. I agree with Red Lake Lassie. I visited all the links and it is true that our government is using public money to cover those political party donations. SHAME! Something or sombody is wrong. My understanding is that Clico Insurane was in bad shape. Now I am hearing that Clico Mortgage and Finance is in trouble. How can this be if there are at least 3 Financial entities trying to leap over each other for CMF? Someone is not being accurate. well lets start with the fact that no audited statements were produced for these large financial companies with David Thompson as their lawyer. Do you think any of the 5 international banks in Barbados would get away with this? The shortfall of equity in the Insurance company was in the many millions of dollars for a number of years which was known by both parties. They both failed to act. It is simply amazing that anyone would try and dispute or defend these links and facts. clicker seems to have a good grasp of reality. Some people, you could rub their noses in the poo but they still doan smell the s***. According to BFP there is poor management, there is corruption, yet companies are tripping over each other to buy of CM&F. You have it wrong BFP. Admit it. There is usually a lineup when governments dispose of companies in trouble because after all the public money they go for firesale prices. Poorly run or not, these companies will be sold for pennies on the dollar with the taxpayers absorbing the loss. one has to ask the question if the Barbados National Bank now run from Trinidad is any better shape than Clico? You can bet that if there is a deal and the BNB purchases Clico assets, BNB will probaly only pay a small fraction of what the assets are recorded on the books for. Who will get fees offshore for this juicy purchase? The losses from the sale will inevitably be paid by the citizens of Barbados, not Thompson and definitely not the DLP and BLP who, in a transparent society, would all be facing charges. Pingback: » Payback! Keltruth Corp.: News Blog of Keltruth Corp. - Miami, Florida, USA. You have only restated what is known – that it is the insurance arm that is in trouble. The serious offers are being made for CMFC – which is a very well run company. I went through all the links too and I agree our tax dollars are bailing out CL Group that gave tens of millions to political parties. That means it is true that our tax dollars are covering CL’s political donations and I don’t like that one iota. Those political contributions should be put back into the kitty. Those offers will be pennies on the dollar and our Barbados tax dollars are still bailing out the Trinis political donations. So let’s do a rewind… Thompson wants to buy back shares of BNB.. . For all to see, except for the blind and flag waving followers, everyone was asking why? and how? Was is grand standing for setting this up?Or laying the footwork on this possibility. If CMFC was run or controlled by the same cast of characters who managed to loot and ravage an old respected insurance company directly in front of our esteemed politicians, I highly doubt that assertion. Whatever offers are made for CMFC will be at fire sale prices. While I may be restating known facts, that it is the insurance company that is in trouble, do you have ANY idea how serious this matter is for each and every Barbadian? How much money did CL Financial have invested Credit Default Swaps? How much money did L. Duprey and his cronies have invested in the Antigua-based Stanford International Bank? Were there investments in Millennium Bank of St Vincent and the Grenadines and the Ponzi Scheme that was running down there? How could a giant company which controls more than $100 billion in assets in 28 companies have seen its fortunes gone totally pear-shaped? We have learnt that Trinidad & Tobago Finance Minister Karen Nunez-Tesheira has presided over the billion-dollar bailout of the CL Financial group, even as she herself has owned shares in the conglomerate. Is this kind of fiasco part of Parliamentary democracy in the West Indies? The revelations raise questions about whether Nunez-Tesheira has a serious conflict of interest, why she has not disclosed her ownership of the CL Financial shares before and even why the shares are held in her name and not in a blind trust. Is someone get locked up here or is this another white (black) wash? The T & T Government has agreed to pump in $315 million (US$50 million) to rescue struggling subsidiary companies of CL Financial to protect insurance policyholders in smaller Caribbean countries. It follows an initial $1 billion of taxpayers monies injected into the local financial system by the State to pay depositors, pension and medical plans of the failed CL Financial subsidiary CLICO Investment Bank and CLICO, the country’s largest insurance company. The Antigua agreement meant that Trinidad and Tobago had agreed to inject an initial US$50 million to support the policyholders of Caribbean countries where British American and CLICO companies tether tottering on the brink of collapse. Government diverted US$50 million from the Caricom Petroleum Fund. The Barbados government agreed to pitch in US$5 million, the Eastern Caribbean will spend US$10 million and regional and international institutions have agreed to inject US$15 million in financial support. All I can conclude, is that this is another major financial*heist of epic proportions where the taxpayer continues to bailout the rich and infamous as governments are complicit in what can only be described as a *con on a Biblical scale. Free Press please stop your disrespect to the Government of Barbados. Government of Barbados, please be worthy of respect by passing the integrity legislation that was promised. Please declare conflict of interest rules for Government ministers as promised. Please pass Freedom of Information as promised. And finally, please be transparent by declaring how much CLICO and CL Group gave the DLP during the last election campaign. This whole CLICO issue seems to be out of the spotlight for a while. My main issue is where are the audited acounts for 2008. They should have been released since april 30, 2009 to the public. This is really messed up, and it looks like it’s going to stay messed up as long as politicians don’t have to list out the amounts they receive in donations and their sources of same. Limits have to be established on how much can be donated by any entity and a maximum for donations overall. The fact that this is apparently not the case only begs me to ask how long before BDS is a banana republic? There is no other possible outcome. Play this scenario to the end and the end is always the same. Look around the world, your politicians are being bought and paid for and the citizens of BDS are the one’s paying to take it in the you know where. I say shame on the citizens of BDS for not insisting this be stopped immediately BEFORE the next election with a SEVERE law with penalties for not disclosing. Penalties like the US use for drug dealers where ALL your property is seized and all your money is frozen, and your passport is cancelled. T &T politically is a scary place. If the links are as they appear to be, I say, take a look at the future of BDS, it’s there now in T&T. If it looks like a duck, quacks like a duck, and walks like a duck, it’s very likely a duck. I find all of this to be mildly amusing. CLICO ‘where ever’ was overseen by one man, the same man who went to the Trinidad government to beg for mercy last year. I cant see how people can actually write nonsense like one of these companies was well run and another wasnt. What I think we have to be honest and say is that the regulatory oversight over the Mortgage company was such that the large amounts of funds were not able to be moved from that entity to prop up CL Financial Trinidad. Our debt market is really all that we have and while the Central Bank does not do a fantastic job in the area, its methods and approach in dealing with regulations are very credible. Insurance on the other hand is another matter and has been for while. CLICO is a private company, it does not have to publish its financials as far as I am aware to the public. The documents are a matter of public record once they hit the registrar of companies, the Inland Revenue Dept etc., but CLICO does not have to put the accounts in the paper. Actually most banks, insurance companies and finance companies in Barbados are privately owned and do not have to publish their accounts. Most of these entities publish them as an advertisement – a see how well we are doing statement – to encourage us to invest in them. Only First Caribbean which is BSE listed has to publish theirs by law! If governemnt in a tell all statement were publish CLICO accounts there could actually be a legal backlash. The agreement to publish has to come from the shareholders of CLICO, if I am not mistaken. But in reality, the CL Financial Trinidad company was the only entity which could take the risk. Our exchange controls here do not allow a local company to invest the gobs and gobs of cash that were moving from Trinidad. Last note on all of this, as head honcho at CLICO, Parris once he leaves, is muzzled. If he sticks around he has to answer the questions. Carefully read my words, I am fairly sure no one else here knows as much about everything that has gone on as he does. Parris’ leaving is setting up the proverbial ‘no comment’, because really no one else can. A note on British American (BA) though. Take a drive through Collymore Rock, see the building that cant seem to be finished. What about those policy holders? I think to be honest, CLICO has been paying its committments. To me the obvious standstill on that building is a testimony to BA’s lack of ability to finish the construction and meet its day to day obligations. But that company seems to be the best kept secret in all of this. In the animal kingdom the predator goes after the weakest prey, but we have past it and are running after the prey who is out front…LOL…go figure!!!!! Clico Holdings is not obligated to publish its accounts in the press. it is however obligated to submit them to the corporate registrar. The files which the corporate registrar maintains for such entities are available for the public to review. Abbreviated financial statements for clico mortgage and clico life have to be published in the local press within 4 months after the end of their fiscal period ends. Ok Donald. If you noticed I did say file with the registrar etc. But I guess must clarify, when I said CLICO does not have to put its accounts in the paper I meant CLICO Holdings. And when I said most banks and insurance companies dont have to publish their financials publicly I was referring to detailed financials. The stuff that is published is mostly a waste of time. I live by the ‘full disclosure’ policy to me anything else is a joke. The stuff that the registrar, the Central Bank and the supervisor of Insurance get is nothing near to what we see in the newspaper. The details relating to ownership, committments, contingencies, impairment etc are usually not displayed. To me you cannot summarize those details. If we rewind to the demutualization of the Mutual. The reason why they had to spend so much money and time sensitizing policy holders prior to the actual demutualization process is because most of us were not aware of what our real voice was in the company; we were not clued in! I apologize for misleading you! I agree with you that the financials that are published in the press are nonsense. Those entities however who are licenced under the Financial insitutions act must make their financials available to interested parties on request. However this does not apply to insurance companies. That is my point exactly Donald. I can find no information on BA. My other concern is that the mortgage market in Barbados has been based on initial security via life insurance. I said initial, because I have always found it funny that the bank holds a charge on your property as well as a life insurance policy(s) equal to the initial borrowing. Anyway I digress. The point I was making is that in the event that there is only one fledging life insurance company here (and we are fairly near that point) it will (1) Become increasingly more difficult for the average person to acquire life insurance at the levels necessary to build a decent structure – given current construction prices (competition in insurance is very necessary) and (2) If the special line of business that matures in 2012 is not dealt with in a way distinct from the rest of the life policies, we could be facing impairment of security on some properties and in turn a mini credit crisis. I still cant see how you could have been caught wth your pants down and such a high percentage of your term business maturing in one year. Father Manning has given up the ghost in T&T. – CLICO never stood a chance of earning enough to pay for the high interest rates they promised investors on the EFPAs they sold. Let’s not beat about the bush. When Bernard Madoff and Alan Stanford did that it was called a Ponzi Scheme. – The assets held by CLICO were overvalued in their accounts. As an example, the rumours are that they didn’t actually own Sam Lord’s Castle, they just had an option to buy it. When other people have done things like that it’s been called fraud. Dear Mr. Thompson, How much money did the DLP and your election campaign receive from Leroy Parris, Mr. Duprey or any of the CL / Clico companies? Remember the Crime and Violence campaign a few elections ago and the foreign lady Jennifer Lazlo who was brought in? Well I have heard from reliable sources that the funding for that initiative came from Clico and was approx. Bds. $1 million. Mr Dupre and his band of merry men seem to have robbed from the poor and given to the rich. Now Thompson and his merry band are using our hard earned money to help his pal Leroy, out of a hole. And still Parris rather that shut his mouth calls a press conference and lambasts the Nation and BLP, for his mismanagement of the affairs of CLICO. There is a need for forensic audit of CL Financial, CL Holdings Barbados and those guilty of mismanagement need to be held to account, and if guilty made to have their address changed to HMP DODDS. Explain all the recent developments for a poor pensioner’s benefit. Are NIS Funds in the CLICO Basket of investments and how much? Are credit union funds in the CLICO basket and how much? Are there taxpayers funds and guarantees given by Bdos government in the CLICO Basket too and to what extent? What implications are they for those who have mortgages with CLICO? What implications are they for depositors? What implications are they for policy holders in Bdos? Is the CLICO Barbados operation obligated to the Trinadian Operation of CLICO first or second? What is the true picture in this matter? >Are NIS Funds in the CLICO Basket of investments and how much? >Are credit union funds in the CLICO basket and how much? >Are there taxpayers funds and guarantees given by Bdos government in the CLICO Basket too and to what extent? *Don’t know. Only the Government or management of the relevant clico entity can answer this. >What implications are they for those who have mortgages with CLICO? * Keep paying your mortgage. >What implications are there for depositors? * for clico mortgage there should not be any if they are taken over. for clico life there should be no depositors. * this will be determined by the suppervisor of insurance and ultimately by the government. >Is the CLICO Barbados operation obligated to the Trinadian Operation of CLICO first or second? At the end of 2007 there was over BDS$11 million owed by the ultimate parent company of clico life Barbados. Pingback: » “Bankster” - An Old Word Spanning the World Keltruth Corp.: News Blog of Keltruth Corp. - Miami, Florida, USA.